Love the leg post!!! and girl, i've been at a plateau for months - although mine is more related to emotional eating. You're doing great!! You have every right to feel proud of your legs. Sorry to hear about the plateau, but I'll bet it doesn't last too long. You're continuing to eat healthy foods and exercising. That the winning combo. Since I am still stuck at the starting gate, I haven't yet experienced a plateau. I need to figure out how to get this stalled car moving. Your clothes are bigger, you're running faster and you have the right mental attitude. Keep strong Mary, the scale will move for you. I appreciate this post so much. You show us physically how this all paid off. I like the shadow play on your leg photo. Interested in what the tattoo is. I have not been in the diet game (on this level) for long, so I have no idea of plateaus. And the "I am too big to exercise" excuse I use is not doing my body any good. I use my arms a lot and have noticed with even my near 40 lb loss that I feel some things changing. Also, those muscles you've been admiring? They're probably the exact reason the scale isn't moving much. So happy for you. Hoping to be more in the blogging world and looking forward to following your progress. My legs are my greatest assets right now as well! You look nowhere near 196, you look much smaller! I love this post! I had a similar feeling about my legs lately...noticing muscles that didn't seem to exist before! It's awesome to start loving parts of ourselves! And that second photo is a great one btw! I've never had a plateau, but I've also never done the same thing for more than a month in a row. I tend to mix up my activity a lot. Leg envy! I've been on many a plateau before. On thing that seems to work for me is to vary my eating/calories over a few days or a week to confuse my body. Like... eat less one day and more the next. I admit, I've never been able to lose more than about 1 to 1.5 lbs a week. I'm just a really slow loser, but I'm pretty steady about it as well. Maybe as you get closer to goal, you're just going to lose at a slower weight, and that will help you at maintenance when you get there? I LOVE that last picture - it's amazing!! I'm not going to tell you how long I have plateaued or what I did to try to get over it because it might depress you... or me to write it. Eventually it will pass. Until then can I suggest raising your legs in the air as you lay in bed and then having a look? I did a lot of sports in high school and college. 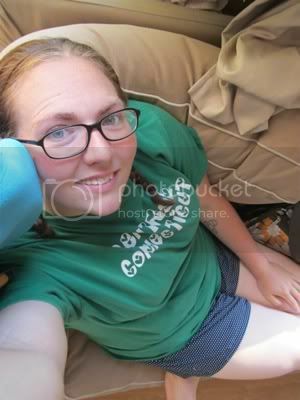 I have a picture somewhere around here that my roommate took of me with my legs up (smirk~with my feet holding a beer). I loved that picture! My legs were absolutely at their peak of chiselyness. Not an ounce of fat, just skin over muscle. What? Where am I? Oh sorry, I drifted off into dreamland there. Anyway, try it with the legs up. All excess skin and whatnots fall to the back. Snap a picture while they are up there! Congrats on the lovely pegs. So many ways to show them off. You really are my hero . . . I wish I lived in the city (I would MAKE MYSELF go out and run with you. ok - you could run, and I would walk. But eventually I would be able to run with you.) BE PROUD of those legs!! Someday I'll be proud of mine, too. Someday. I have no advice to give for plateaus, sorry, but I can tell you I'm cheering for you! I still remember putting my hand on my thigh and realizing I could feel the muscle under there! Congratulations to you. I went through a lot of plateaus - the longest was a couple of weeks. You have a great attitude! Plateaus can be good to learn lessons like accept yourself as you are (because you are beautiful just the way you are) and enjoy the journey (what if today was all you had?). Keep trying. Never give up! :) It does get easier. We should all love our legs as much as you do. They do so much for us without us every thinking twice about it. I'm recently off a plateau. I told a WW leader on Tuesday that I honestly think it was my body saying, hey, I need a break. No matter how frustrated I was, I refused to give up. And the last two weigh ins have been very successful. Woohoo! Your legs look so hot! I say who cares about plateaus? Just keep living the healthy lifestyle, go through phases of maybe not losing as quickly, but living right. It's FOREVER anyway. Even while you are losing weight your life is happening right in front of you. You gotta live it! You are doing awesome.